Ever since the introduction of real-time search last December, Google has added content from sites like MySpace, Facebook and Buzz. The data is now available in 40 different languages. 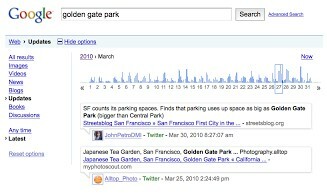 Google has also added a links feature to help people find the most relevant information with updates from Twitter. Google has now introduced another feature, to access whatever data is needed from all the Twitter archives. Since blogs, tweets and online conversations are constantly adding to the search content, it is difficult for users to access information of some time ago. With this new feature, it will be possible for people to ‘replay’ whatever was being said on Twitter about a particular topic, at a given point of time in the past. To do so, users should first click on ‘Show Options’ on the search results page. They must then select ‘Updates’. They will first be shown the latest and greatest short-form updates but they will also see a new chart at the top, from which they can select the date, month and year, and they will see all the Tweets on the given topic from that day onwards. The chart will also show all the spikes and dips of Twitter activity on that subject. This new feature will allow users to go back in time to study the opinions on the subject at that time. The feature is just being rolled out in English initially, and will allow people to go back to the Tweets up to February 11 2010. Later of course, it will be possible to go back to the starting of Twitter, way back on March 21 2006.